Get the newest smartwatch, before it’s too late. Apple Watch Series 4 44 mm Space Gray Aluminum Case with Black Sport Band (GPS . Condition is New. Shipped with USPS Priority Mail. Trending at $449.00eBay determines this price through a machine learned model of the product's sale prices within the last 90 days. Notifications of your friend's progress act like a personal trainer to keep you going. The Apple Watch Series 4 stays connected to the outside world via Wi-Fi or a wireless Bluetooth connection to your iPhone. Wi-Fi Only. Condition is Used. Trending at $405.00eBay determines this price through a machine learned model of the product's sale prices within the last 90 days. Apple Watch. Sports Band. You will get your item as soon as possible. May not work with Verizon. Trending at $399.97eBay determines this price through a machine learned model of the product's sale prices within the last 90 days. Condition is Used. That band makes it so much easier to put on, plus, looks nice too. I have about one of everything from Apple so I got this, but I am just not a watch wearer. Well done Apple for a very nice product, but, like I said, I am just not a watch wearer. 7/10 condition. Deep scratches on the screen. 3rd party Black Nylon Loop. Unlocked and ready for new user. 3rd Party Black Nylon Loop. Apple Warranty. W3 Apple wireless chip. Aluminum case. 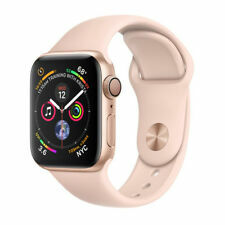 Apple Watch Series 4 44 mm Gold Aluminum with Pink Sand Sport Loop (GPS) . Condition is used but excellent condition. I’ve only had it 3 months. Comes with a metal band as well. Shipped with USPS Priority Mail. Pink Sand Sport Band. Includes: Apple Watch, band, charging cable, and USB Power Adapter. 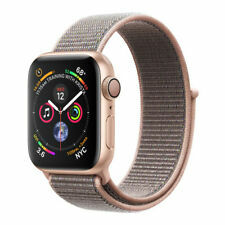 Apple Series 4 Watch - Gold. We respond to all inquiries within 24 hours and typically much sooner. We are here to assist you! "We will describe the item to the best of our ability. Lightly Used. Gold Aluminum Case . I bought it onSep 24, 2018,still under warranty (1 year warranty). It's in super EXCELLENT condition. Super clean, n o scratches at all. Height: 44mm. Your product is covered for eligible hardware repairs and service under Apple’s Limited Warranty. Estimated Expiration Date: December 6, 2019. See photos. New condition in White Box not the original apple Box. Apple Watch Series 4 44 mm Space Gray Aluminum Case with Grey and white sport loop band and black Apple silicone band. This is the CELLULAR VERSION. Condition is slightly Used. 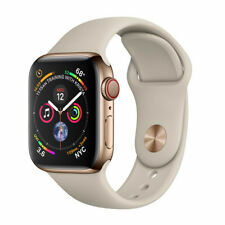 Apple Watch Series 4 44mm Gold Aluminum Case Pink Sand Aluminum Band GPS LTE Cellular. Comes in original box w/ charger & AC adapter. This watch is in very good condition showing some very minor signs of wear please see photos. Buyer pays shipping highest bidder wins. Condition is Used. Shipped with USPS Priority Mail. Apple Watch Series 4 44mm Space Grey Al with Blk Sport Band (GPS Cellular 4G). Condition is New. Shipped with USPS Priority Mail. 9/10 Condition. Light scratches on the screen. 3rd party Pink Sand Sport Loop. Unlocked and ready for new user. 3rd Party Pink Sand Sport Loop. W3 Apple wireless chip. Apple Warranty. Aluminum case. Just a few months old, been sitting in desk drawer. Watch has been reset to factory settings. 8/10 condition. Visible scratches on the screen. 3rd party Pink Sand Sport Loop. Unlocked and ready for new user. 3rd Pink Sand Sport Loop. W3 Apple wireless chip. Aluminum case. Up to 18 hours of battery life2. Apple Watch Series 4 44 mm Space Gray Aluminum Case with Black Sport Band (GPS . Condition is Used. Shipped with USPS Priority Mail. This watch has a leather band. Looks like the black Nike band was never installed. Watch is nearly new. Model number is A1978 or MU6L2LL/A. There is no "buy it now" price. Trending at $459.00eBay determines this price through a machine learned model of the product's sale prices within the last 90 days. 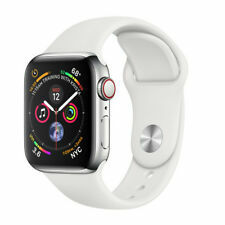 Apple Watch Series 4 44 mm Silver Aluminum Case with White Sport Band (GPS) . Condition is Used. Shipped with USPS Priority Mail. No issues with device. Includes original packaging as well as an additional blue watch band (Pictured). Let me know if you have any questions. Watch is new out of the box. I powered it on and played with it for about 5 minutes. This was a gift. Don't want a watch. Series 4 and screen is 40mm. 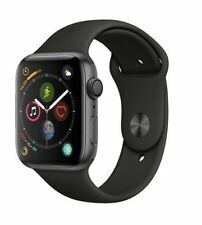 Apple Watch Series 4 44 mm Space Gray Aluminum Case w/Blk Sport Band GPS Cellular. This is a used Apple Watch Series 4 44mm in great shape! Come with original box and accessories. This is the GPS and Cellular version so you can add your data plan onto this. Let me know if you have any questions! 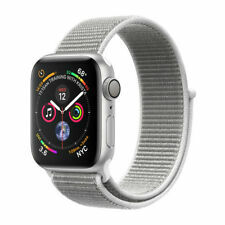 Apple Watch Series 4 44 mm Space Gray Aluminum Case with Black Sport Band (GPS). Condition is Used. Signs of regular use. With 2 additional cloth material bands green, blue and case protector. Space Gray Aluminium Case. iWatch Series 4. Black Sport Band. Original Box available. MINT Condition. 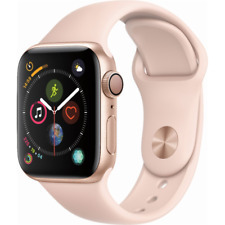 Apple Watch Series 4 40mm Gold Aluminum Case with small Pink Sand Sport Band (GPS only). Barely used and in PERFECT condition! Includes Apple Watch charger. Shipped with USPS Priority Mail. Gently used with extra band! 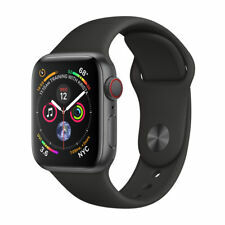 Apple Watch Series 4 Black Sport with Band S/M & M/L. Used for total of 2 weeks. 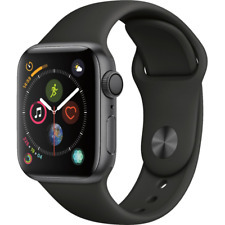 Apple Watch Series 4 44mm Space Gray Aluminum Case with Black Sport Band (GPS). Used for two months. Works great. Comes with both size bands, charger, felt case, original boxing. Shipped with USPS Priority Mail. Works great, minor scratches on side by crown as shown on image. Condition is Used. W3 Apple wireless chip. Up to 18 hours of battery life. Aluminium case. Bluetooth 5.0. Wi-Fi (802.11b/g/n 2.4GHz). Sapphire crystal and ceramic back. Ion-X strengthened glass. Louder speaker. That way you get your item as soon as possible. Condition is Used. Watch works fine otherwise.